If you’ve only ever used instructor led training, the idea of moving your learning and development online can seem a little daunting. But cloud-based training can easily make e-learning a reality in your organization; with little hassle and minimal cost. 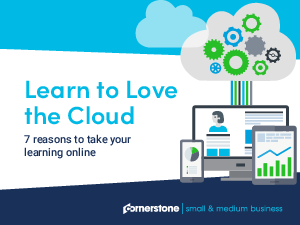 Grab your copy of Learn to Love the Cloud and see how e-learning can save you time and money, help you be more strategic with your training, and empower your learners to take charge of their professional development. It just makes sense!